Ray, Mick and Jim recording and removing the roof tile horizon in Structure Twelve. We will begin today, as we did on Friday, with pottery. You may recall we showed a photograph of an incised pot rim from under the bone deposit at the end of Structure Ten. It was puzzling because the bone has already been dated to 2300BC, around the end of the Neolithic period. But the pottery did not necessarily fit with that date. Dr Ann MacSween, who dug with us last week, and who is an acknowledged expert on prehistoric pottery, went home to Edinburgh and consulted her records. She now believes that the pottery may be early Bronze Age, although dating it more precisely than that is not possible. 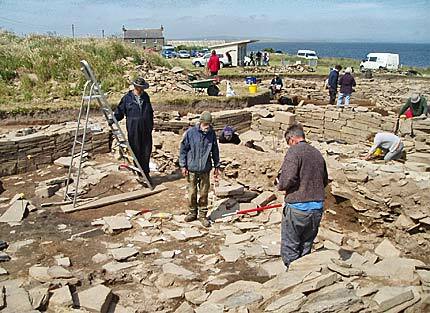 It is very similar to a sherd from the site of Toftsness, on the Orkney island of Sanday. This adds a fascinating potential new chapter to the period when the Ness, and in particular Structure Ten, went out of use. It has never been clear how, or why, the long and successful period of activity at the Ness site came to a close. Structure Ten was undoubtedly decommissioned in a deliberate way, but did the people who carried out that decommission simply want to go elsewhere? Or did they feel compelled to change some of the ways in which they lived out their lives? Were they subject to influence or compulsion from the users of the new Bronze technology? The advent of the Bronze Age was certainly a time of change. Population dynamics, the use of pottery and the treatment of the dead all changed. Some experts have even suggested that Orkney resisted the changes implicit in the advent of new Beaker phenomena for longer than in other places, such as Aberdeenshire. However, there is now a stronger possibility that the end of activity at the Ness complex did coincide with the advent of the Bronze Age and the Beaker pottery as previously speculated. A good deal more thought and work will be necessary before this possibility can be fleshed out further. However, if the discovery of this pottery and Dr MacSween’s identification shows anything, it shows that humble pot sherds retain the ability to shine a sometimes startling light on the archaeological evidence and the way it is interpreted. On a fine, bright and sunny morning “the Willamettes” arrived today. This is the annual contingent of students who come from Willamette University, Oregon, under the leadership of Professor Scott Pike. 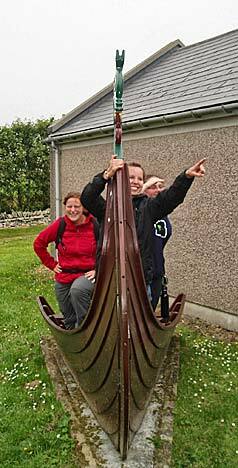 Site director Nick took the new arrivals around the archaeological sites of the West Mainland yesterday. Today, they have been quickly inducted into Ness ways and are now happily helping with the excavation of the new Trench T.
Among the eleven students are returnees Jo and Garnet. Many will remember Jo’s ecstatically happy face from the front cover of the British Archaeology magazine when she discovered the beautiful dark blue and white polished stone axe last year in Structure Fourteen. Both she and Garnet will be conducting special projects this year with Professor Pike. 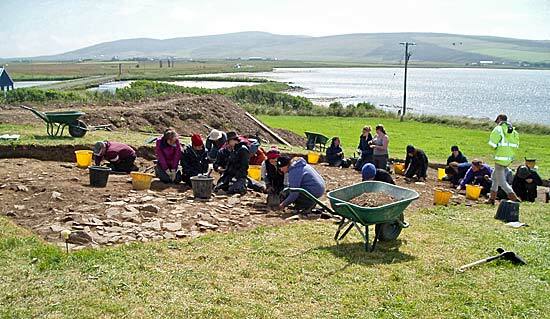 The rest of the students, including the undergraduate contingent from the University of the Highlands and Islands, will be experiencing the full range of archaeological techniques. This will include flotation (washing and sieving) soil samples in the new purpose-built facility designed by our marine environmentalist, Dr Scott Timpany, at Orkney College. Hugo has been busily filling sample buckets from Structure Fourteen for that very purpose. Meanwhile Scott (Pike) has augured the midden around Structure One. This may well show the true depth of the natural soil and will help with the reconstruction of the phasing of the site. 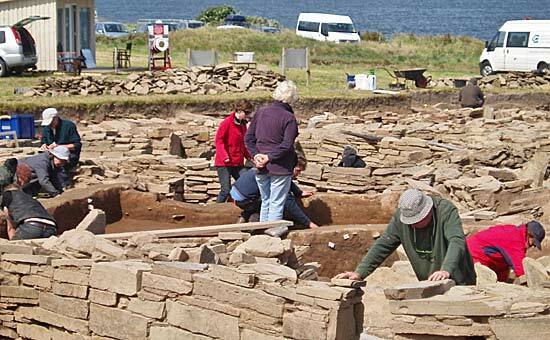 Lastly, Neil Oliver’s popular television programme on the Ness of Brodgar was repeated on Australian television over the weekend. That resulted in 3,000 hits in two days on this blog from Australia and around the rest of the world. We look forward to seeing you all next year. Trench T takes shape with the UHI students and the newly arrives Willamettes. The Standing Stones of Stenness are visible in the background, on the other side of the Brig o’ Brodgar. Mud to Museum: Making Sense of Archaeology . . .
My name is Dr Michael Olsson, a senior lecturer in communication studies from the University of Technology, Sydney. My role on the site is quite different from that of the other researchers on site — I am studying not the archaeology but the archaeological team itself. I’m also convener of “knowledge sharing and Information” research for UTS’ Cosmopolitan Civil Societies research centre. I am here at the Ness undertaking preliminary ethnographic fieldwork for a new study Mud to Museum: Making Sense of Archaeology. 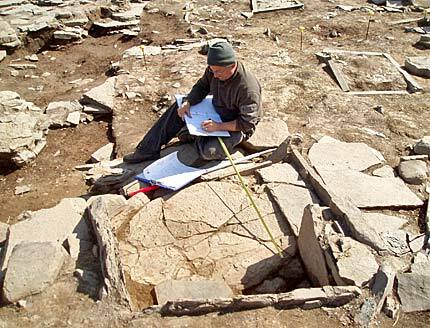 Archaeology is a complex, and increasingly interdisciplinary, area of research and a large dig like the Ness of Brodgar brings together an international team of people with very different specialist skills and experience, all needing to work together as they try to make sense of this extraordinary and highly complex site – making it an ideal research site, from my point of view! Billy contemplates the removal of the blocking in the later end entrance to Structure Twelve. Becoming an archaeologist involves many years of study and a deep engagement with a complex body of theory and research. However, being a field archaeologist involves developing another quite different set of skills: how to dig; use a trowel, handle delicate artefacts and a range of other physical skills (what I would call embodied knowledge). All over the site, you will see students and volunteers learning these skills from the more experienced team members. Experienced team members show beginners the right way to do things and the neophyte diggers copy their ways of working. Hugo record one of the newly cleared end recesses of Structure Fourteen. Although the site is awash with high-tech cameras, GPS loggers and other sophisticated recording equipment (Including Hugo’s amazing kite camera! ), all over the site, you will see people, from site director, Nick Card, to students and volunteers, using old-fashioned pencil and paper to draw the site’s features. What is behind this seemingly luddite behaviour? Not only can a hand-drawn plan be the most effective method for indicating a section’s most important features, drawing can be an incredibly effective mental strategy for team members to develop an intimate understanding of the area they are working in. Identifying finds on a Neolitihic site is a complicated business, often looking alone isn’t enough: a stone tool often looks like an ordinary, garden variety rock! Experienced team members can be seen carefully handling stones, testing how they fit in the hand, experimenting with how they might be used. Site geologist, Martha, is teaching diggers to take this further: an unusually heavy rock may be rich in iron ore and make a valuable tool; one with an unusually smooth surface may have been carried some distance from the seashore. Archaeology is a rich sensory experience — although I’ve yet to see any archaeologists trying to taste an artefact! Mud to Museum is a research project in its infancy but working with colleagues at UTS and at the University of Alabama in the United States, the aim is for the project to not only further our understanding of how interdisciplinary groups work together but, on a more practical level, inform the development of new information systems and tools that will make the work of archaeologists in the field easier.